Child sexual abuse is now an epidemic. 1 in 3 girls and 1 in 6 boys are sexually abused before their 18th birthday. The median age for reported sexual abuse is 9 years old. If your child is molested, there’s a 90-95% chance it was done by someone you know, not by a stranger. Rather than continuing to let this situation continue to fester within me, I decided to take action and start a conversation with all of you regarding what we can do to help end the cycle of child sexual abuse in our communities today. This is an incredibly painful and disturbing subject matter to think about because of the precious innocence of the victims. However, if we continue to let that discomfort keep us from doing something about it, then the perpetrator will continue to prevail and the abuse will never stop. I welcome your input, recommendations and insight. Join me, won’t you? 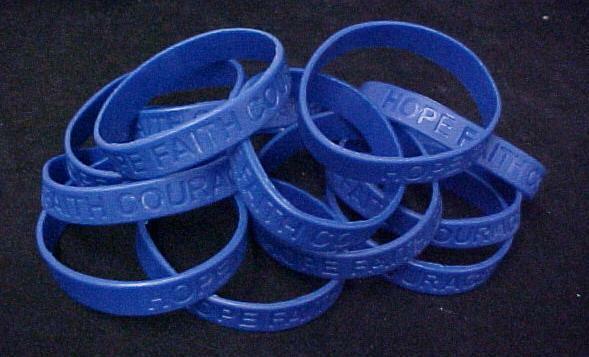 Be prepared to talk about child abuse to those who ask you about the bracelet. This is a highly stigmatized and shame-ridden subject. The more we don’t talk about it, the more children who will continue to go unprotected. Be their VOICE. If there is not such a policy in place, take a role in putting one into effect. If there is one already, make sure that the process has been clearly communicated to all of your colleagues by your administrators. Also, look into having an expert on child abuse speak, such as a policeman/woman or a social worker or counselor, at your workplace. This process begins by doing your own research on the subject and determining what is most appropriate to share with your children based on their age and/or developmental phase. What is most important is that you are creating a safe and trusting environment with your children, or the children in your life, so that they have the space and time and security to talk with you about anything that is bothering them or making them feel unsafe. What else? What are you going to commit to start doing? You can begin by sharing this blog with your community. Thank you. This entry was posted on Sunday, November 13th, 2011 at 3:42 pm and is filed under My Personal Initiatives. You can follow any responses to this entry through the RSS 2.0 feed. You can leave a response, or trackback from your own site.